A simple worksheet for junior groups. 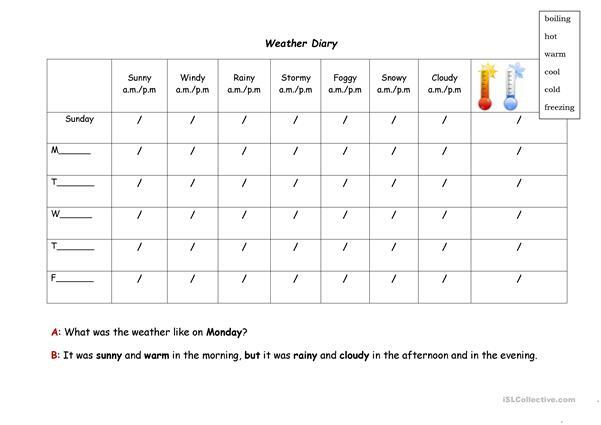 There's a weather diary for the whole week, a poem to learn by heart, two short writing tasks and an error correction activity. The present printable, downloadable handout is best suited for elementary school students and kindergartners and nursery school students at Beginner (pre-A1) and Elementary (A1) level. 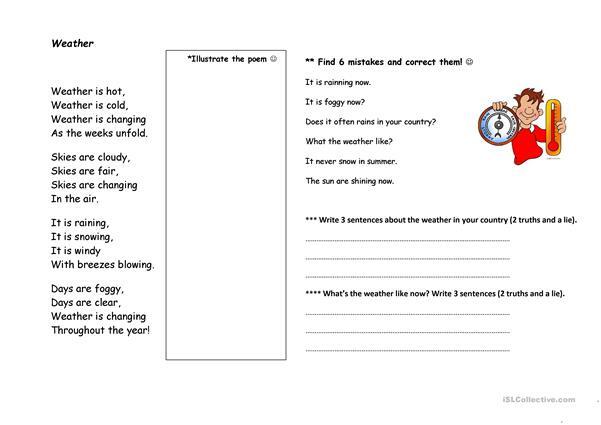 It is great for revising Present perfect continuous (progressive) tense and Present simple tense in English, and was designed for enhancing your learners' Speaking and Writing skills. It is about the topic and words of Weather. aleksandrrra is from/lives in Poland and has been a member of iSLCollective since 2013-02-07 13:43:48. aleksandrrra last logged in on 2019-03-15 14:35:23, and has shared 5 resources on iSLCollective so far.